↑ This is a Buddhist chant. The words in Pali are: Buddham saranam gacchami, Dhammam saranam gacchami, Sangham saranam gacchami. The equivalent words in Sanskrit, according to Georg Feuerstein, are: Buddham saranam gacchâmi, Dharmam saranam gacchâmi, Sangham saranam gacchâmi. The literal meaning: I go for refuge in knowledge, I go for refuge in teachings, I go for refuge in community. 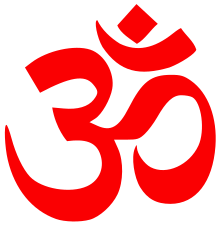 In some traditions of Hinduism, the mantra is expanded to seven lines, with first word of the additional lines being Satyam (truth), Ahimsam (non-violence), Yogam (yoga) and Ekam (one universal life). For example, an additional line with Ahimsam is: Ahimsam saranam gacchâmi.